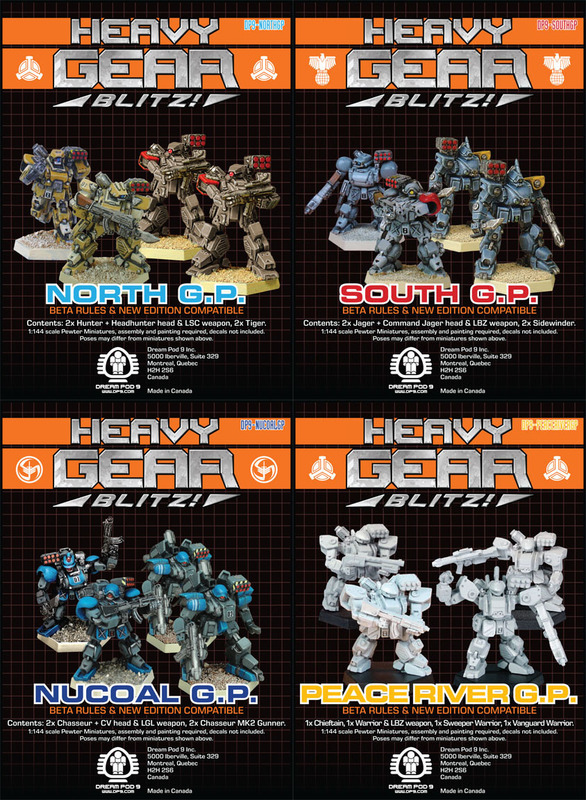 These new squads are compatible with upcoming New Edition of Heavy Gear Blitz and its Beta Rules version (releasing in August at Gen Con). The new edition allows for squads of between 4 to 6 gears (maximum of 6 actions), so we have made new lower entry cost, 4 miniature G.P. squads, for players getting into the new edition of the game. The 4 miniature squad is packaged in one of our full size plastic blisters, in place of a box, allowing for the lower cost. The blister card included has the color squad image on the front, the game stats for the included models and weapons on the back, for quick game reference. - North GP includes 2 Hunters + Headhunter Head and extra weapon and 2 Tigers. - South GP includes 2 Jagers + Command Jager Head and extra weapon and 2 Sidewinders. - NuCoal GP includes 2 Chasseurs + CV Head and extra weapon and 2 Chasseur MK2 Gunners. - Peace River GP includes 2 Warriors + Chieftain Head and extra weapon, 1 Warrior Vanguard, and 1 Warrior Sweeper. Players can select from our available single and two packs of miniatures to bring the squad up to is maximum of 6 gears if they want or to add a support unit to the squad of between 1 and 3 models (upto half the actions of the squad rounded up), which can include: gears, striders. 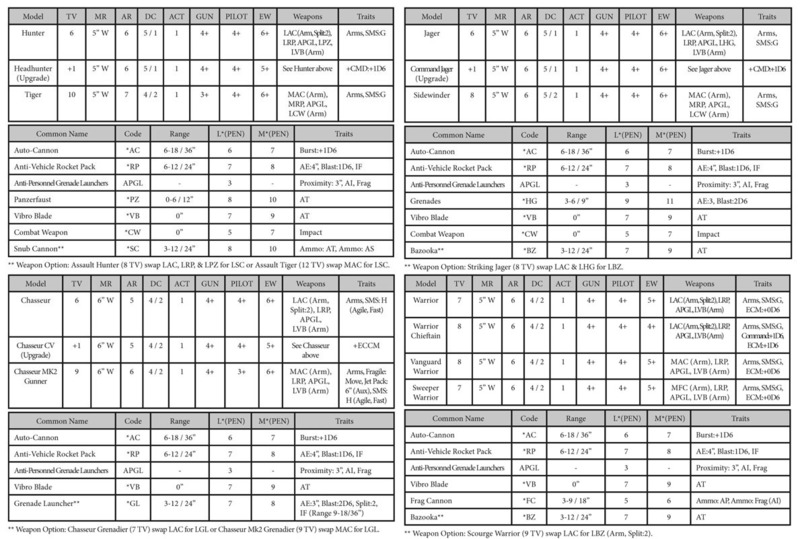 tanks, infantry, and other vehicles. For those of you with older North, South, NuCoal or Peace River GP squads or other squad boxes, don't worry their miniatures will still make legal squads in the New Edition of Heavy Gear Blitz and its Beta Rules version. Just some of the variant weapon loadouts may be updated or removed for better game balance and some Threat Values revised during the Beta phase. The new 4 miniature GP squads are available now for Pre-Order on the Dream Pod 9 Online Store for $35.99 USD each and will start shipping on August 8th at the same time as the Beta Rules. Here is a link to the online store, the new releases show up in the Latest section at the bottom of the page or on the top of each individual faction's page. Plus once your on any of the new GP squad order pages there is an option to add a copy of the New Edition HGB -Tabletop Wargaming - Beta Rules to the order for a special price of $14.01 to bring total to $50.00 USD. Which during our summer shipping promotion gives Free shipping to Canadian and US orders of $50 or more. And for those of you who want to get some friends into the game, you can pickup the other 3 squads for the special price of $32.99 each at the same time.